Much of my writing begins as merely a series of notes I make so as to keep from forgetting what I have learned. To be honest, I don't exactly remember what prompted to me write this one. Perhaps it was some romantic delusion of grandeur that led me to believe I could offer something to this field that someone else could not. I do recall thinking however that in spite of what seems like a vast quantity of material on the subject of false dealing, there seems to be remarkably little material on the subject of stacking. Furthermore, having developed my own methods independently prior to reading the only two documents I have been introduced to on the subject, I found that the material available, at least according to my limited exposure, seemed dreadfully insufficient. It strikes me that most false deals are only really useful once you have a stack in place, thus it seems natural that false dealing would be coupled with stacking. I have also noticed that, at least from my perspective most of the stacking that takes place is horribly unrealistic due to the fact that the cards seem to start on the top of the deck. When I began teaching myself riffle stacking, the entire point as far as I was concerned was to work with a deck in random order, after all, how often do you really end up with four aces or a royal flush on the top of the deck, even using discard stacking? Let alone ending up with two killer hands on the top of the deck in a usable manner? These conditions seem to me to be so altogether improbable that I begin by assuming they do not exist. Of course, they may, but it would be a rare occasion that they did. 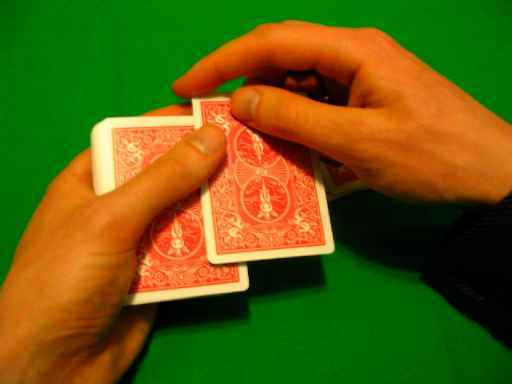 Now in reality one would not typically control such exotic hands as a four of a kind or royal flush for themselves, especially not consistently as it arouses suspicion, thus the use of skills based on discard stacking as opposed to a random deck become more understandable from the perspective of a real gambler, which I most certainly am not. However, my interests have always leaned towards the exotic. I have a flare and a passion for the extremes of card manipulation and since I am not a gambler trying to win without arousing suspicion, stacking a royal flush or four of a kind holds a much greater appeal to me than stacking three of a kind and remaining safe. It is with all of this in mind, that I approach this book, which will cover both shuffling at the basic levels, controls for magicians, stacking along with culling and of course, the false dealing I feel is tied so closely to the stacking. To explain how this all came about perhaps I will take you back to my very beginnings in card control and even before that. I remember as a child sitting around with a babysitter who was teaching me how to play poker. Once when it came his turn to deal he ended up with some exceptional hand, I don't recall anymore what it was, but I was amazed and was of course easily beaten. He informed me however that this was not his real hand, he had stacked the deck, I had been oblivious to it. I watched him closely from then on and to my relief or perhaps, subconsciously, to my disappointment he never did it again, stating that he couldn't do it while shuffling so fast. Nevertheless, my interest in the whole process was sparked. In the years that would follow, I did very little in an attempt to learn the process, but the seeds had been planted.